Honey moon Thailand, Maldives, & Malaysia. Hey guy's my soon to be wife and I, plan on getting married next year. I need some tips about honeymoon tours, for Maldives, Thailand, and Malaysia. Thanks for your input! Re: Honey moon Thailand, Maldives, & Malaysia. Been to two, not the Maldives. Both good. Check out very carefully when you intend to travel, especially to Malaysia, as the weather in some regions may be very wet. In these regions it is indeed advised to keep the seasons in mind. I've only been to Thailand, but I guess this goes for the other countries as well. If you want good weather, you should go in the winter. The dry season more or less goes from october to march. From april to september is the rain season, not the best time for a romantic holiday. It's hot and humid and everything is wet. The islands of Langkawi and Penang seem to be real recommendations from what I've heard. Never been there myself, but if you're going to that part of the world they're sure worth a visit. Any tour companies that you guys recommend that schedule activities etc? Or just recommend booking with Hotel concierge? Resorts on the western side of the Malay peninsula are generally closed during October to March. The east (including Langkawi and Penang) is OK during this time. If airplanes really interest you, which I assume should since you are on this site, drag along your wife to the Royal Thai Air Force Museum when in Bangkok. There are about 60 aircraft from biplanes through WWII warbirds to jetfighters as modern as the Gripen. (A canteen and a souvenir shop can take care of any thirst, hunger and memento needs). I've been there twice - the recent one being just a week ago - and will certainly go again. Both times I spent half a day on the indoor and outdoor displays. The Museum is in Don Muang Airport but across the runway from the civil terminals, so its accessible only indirectly round the end of the runway, on the public road of course. 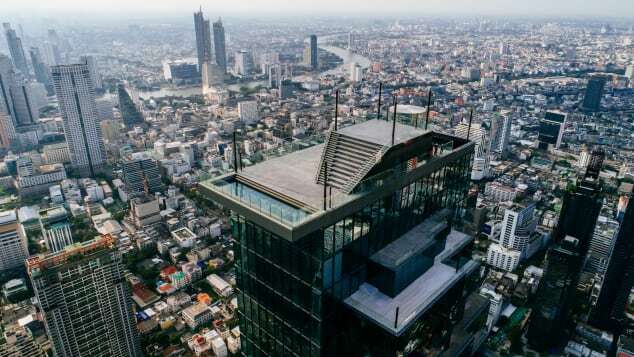 And in the city itself, you can head for the just-dethroned (by only 2 metres) tallest building in Thailand; the 314 metre tall pixellated King Power Mahanakhon Tower. Entrance fee to the Skywalk observatory is 1,050 Baht or roughly USD32. Besides the panoramic 360 degrees view, there's glass floor jutting out at one side to accord a heart-thumping, vertigo-inducing straight down view to the streets below. A good time to be up there is an hour or so before dusk so you can take in the day, sunset and night views. A bar at the top serves a selection of cocktails and both soft & alcoholic drinks. Great for a romantic evening out. The "glass tray" at the top of the King Power Mahanakhon Tower. When I was there I just booked at the hotel, they mostly know which activities to recommend and which to avoid. For example I took a workshop in Thai cooking which was quite fun. I don't know if cooking is your thing, but I quite like it. They take you to the market where you learn to know the ingredients and such, and then you go to their facilities and you cook the most delicious food you've ever tasted. In the end you get a book with recipes and I have to admit, here at home I still cook Thai food every once in a while. Hotels can also book train tickets for you if you like. I know as an aviation enthusiast you might prefer to fly, but it's nice to try another form of transport for a change and the train is a good chance to see some of the countryside outside the cities. When I was in Thailand I first flew from Bangkok to Chiang Mai, stayed there for a few days and then took the train back to Bangkok. What's an hour flight is a whole day in a train, but it was definitely worth it. In my experiences, Thai cooking classes are immensely popular so it’s definitely a thing to do in Thailand, at least in Bangkok and in the north. I’ve also flown between CNX and BKK, and with hindsight wish I took the train: Thailand can get extremely touristy and it would be been nice to see something different. Also would have stopped at Ayutthaya since it’s between CNX and BKK. I’ve been to a few islands in the south, but you need to be careful which ones you choose as some can be overrun with the backpacker/party set. Malaysia in my opinion is gorgeous. I spent nine days making my way from Malacca to Penang with stops in KL and the Cameron Highlands, and if I had more time would have gone to the Perhentian Islands to dive. I can’t speak for the Maldives, but I think Thailand might have a bit more variety than Malaysia, but it has noticeably more tourists too. Yes, Malacca oozes charm. I've been there umpteenth times. You can stay in the Jonker Walk area and explore the old town environs. And less than 3km southeast is a Portuguese enclave where they serve good seafood dishes by the sea. Nice place to while away a dovey-eyed evening. I can highly recommend Penang and Kuala Lumpur. Although both are in Malaysia they have a very different vibe. In KL you can enjoy some super good street food on Jalan Alor and you should go up the KL tower. Malaysia was my first country to visit in Asia and I always love to go back.